Warm weather is coming. Warm weather is coming. This has become my mantra over this very long winter. This caprese salad is one of my mental escapes from winter. It is so refreshing that it screams springtime to me. Super easy to make with fresh basil, creamy mozzarella cheese and fresh heirloom tomatoes, this is perfect as a side salad or an amazing appetizer. Of course this caprese salad is perfect for the hot summer months. It is the perfect side for just about everything, pairing well with pasta, quinoa and grilled vegetables. You can finish this salad with a drizzle of olive oil and a bit of sea salt or a balsamic glaze. Once the farmer’s markets open, I try and source all, if not most of the ingredients from them. I get the freshest produce available and support our local farmers at the same time. Delicious on its own, this salad is perfect as a starter for any meal. At holiday dinners, I like to serve my caprese salad together with a cheese and nut board as the first course. 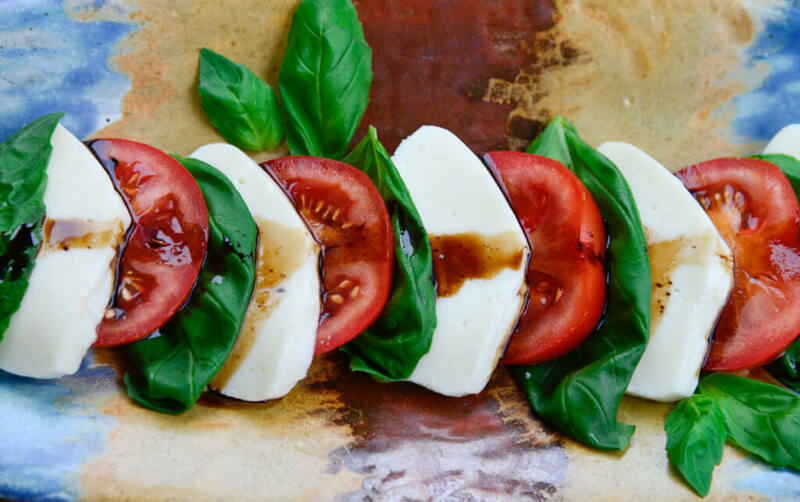 Fresh ingredients are key to the perfect Caprese Salad. Wash the tomatoes and slice off the of tops. Slice the tomatoes into 1/2"-3/4" slices. Take the mozzarella and (if not pre-sliced) slice into 1/2"slices. 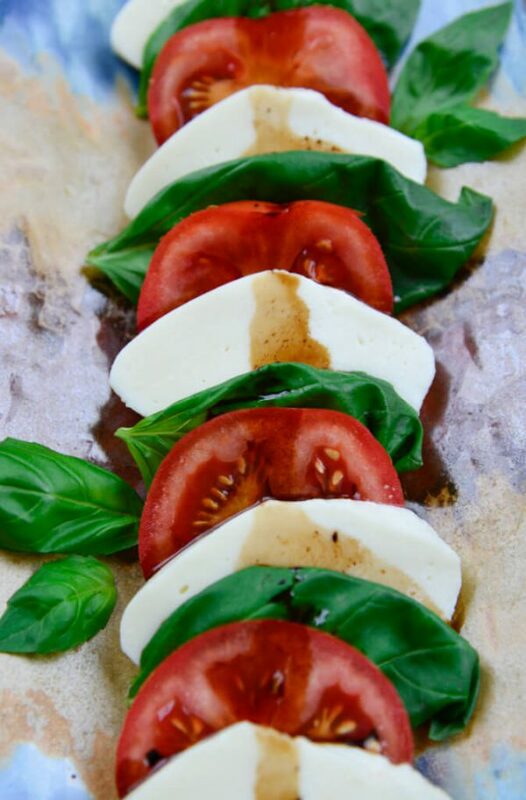 Wash and dry the fresh basil leaves and find the leaves that fit in between the tomato and mozzarella slices. Take the smaller pieces and when finished, arrange on the platter as garnish. Take the fresh basil, tomato and mozzarella and arrange them alternately on a serving platter. Optional toppings are a drizzle of olive oil and a sprinkle of sea salt or a balsamic glaze. It is honestly that simple and yet incredibly delicious. For a balsamic glaze, take 1 cup of balsamic vinegar and 1 tablespoon sugar heat in a small saucepan until reduced by half about 15-20 minutes. Let cool. This Caprese Salad recipe is gluten free and vegetarian.